Ah, late summer mornings, fresh, yet warm and sunny, when fields are rich-yellow and the river Danube so tranquil (so much so that even a Buddhist temple was recently opened at the Danube riverbank). It’s the migration season. 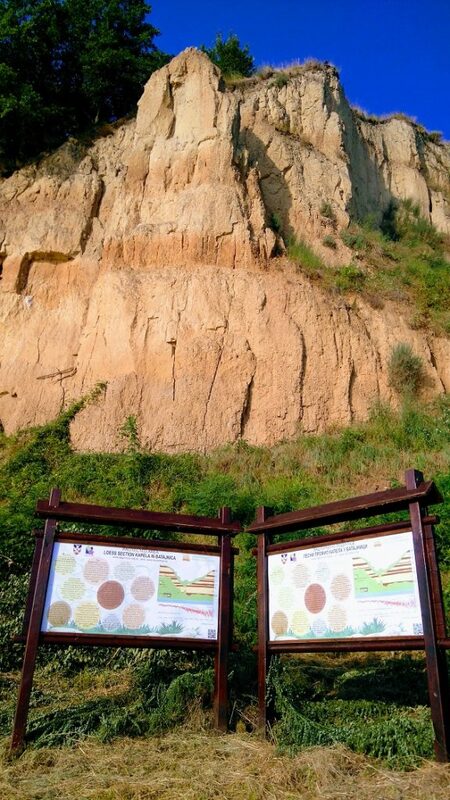 This morning I drove to the Kapela (“a chapel”) research area of mine, a small geological reserve 15 km / 9 mi upriver from Belgrade, whose management is interested to know whether there is more than just 620,000 years of sediments exposing the ancient glaciations in a high loess bluff. And the answer is yes, there are dozens of European Bee-eater and Sand Martin (a.k.a. Bank Swallow) holes, among 60+ other bird species. Today, there were maybe 50 Sand Martins flying over me, but it took me a while to ID them. However easy they might be, I was there so early and the sun was so low that their white undersides were bright-WHITE and I had to observe several birds in a row just to be sure. Yet, nothing of the calmness of my previous visits remained: a week ago, the reserve was recommended in some angling magazine and I found parked cars and a dozen people, swish-swooshing their fishing rods. Consequently, there were no Common Sandpipers, White Wagtails or Little Egrets foraging the shallows. Darker fluvial soils formed in interglacial periods sandwiched between lighter glacial loess deposits. Rich ochre-sediments above (with darker fossil fluvial soil-deposits formed in interglacial periods and sandwiched in between loess, which is a grinded rock and not a soil), bubbly voices of invisible bee-eaters (probably way too high on migration) and some movement in the bushes overgrowing the loess bluff… among the leaves… leaf warblers… without any field marks – non-describable leaf warblers… which defines them as Common Chiffchaffs. Moving through the leaves, they are at my height and, opposed to the usual having them somewhere high above, every now and then I get a short but good view of one of them. Glistening wavelets at the shore, screeches of gulls… and another movement in the leaves between me and the Danube! The movement I can see, but I am waiting for a chance to see the bird itself… wingtip and the tail only… no use. Then, for a split second, a head! Dark-grey cap and ear-coverts in contrast to white throat – the Lesser Whitethroat! In the Bird Identification guide, it is deservedly described as an introvert. You can hear its song in spring, but even then, it is a rare privilege to have one posing at the very ends of willow branches right next to one’s car. A narrow bluff-top buffer zone is also protected. It consists mostly of old orchards and rustic summer cottages, extending into huge cornfields. Beside several Red-backed Shrikes, there’s one bird standing at the top of the corn plant, but its silhouette doesn’t resemble a shrike. As I was trying to get closer, it flew further away. Getting closer again, about to focus and it takes flight… but not before I managed to spot the buff eyebrow of a young Whinchat. They are declining in Serbia and in these lowlands, they are nowadays commonly spotted only on migration, but have mostly retreated from the plains (except some steppe pastures) and in the breeding season are common in the mountains above the upper forest line. Above a meadow between orchards is a raptor… a Eurasian Sparrowhawk soaring… and another… two sparrowhawks, one clearly larger – a pair! 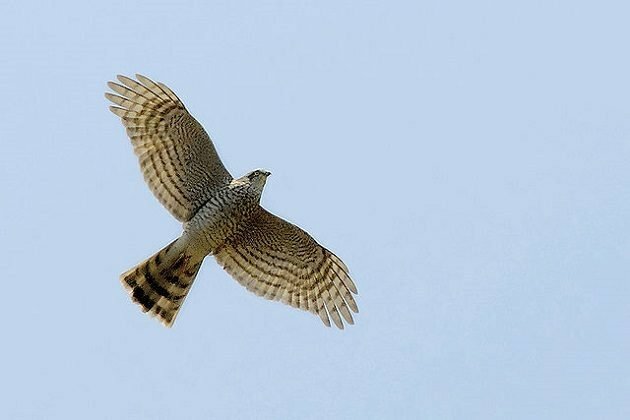 Female sparrowhawks are typically 25% larger than males and often twice as heavy. The two birds would make two or three circles together and then the male would fly into the female from above, almost like if they were about to interlock claws, but the actual interlocking never happened, only a few wingbeats facing each other and off into the next series of soaring circles. A pair displaying at the end of August, well after the breeding season? Populations of Eurasian Sparrowhawks consist of territorial breeding pairs (and non-territorial non-breeding floaters). Pairs are monogamous during each breeding season, but may change mates from year to year. So, what I am observing is a territorial pair, most likely a successful pair announcing their claim on this territory for the next season as well.